You wash your car and wax it religiously. You look for nicks and scratches that might take away from the beauty of your ride. But, are you as diligent with the interior as you are with the exterior? If you answered no, don’t worry you aren’t alone. You might think you don’t have time or it’s just too much work, but I am going to make it easy. In less than 30 minutes each month, you can keep your car’s interior just as clean and pristine as the exterior! Here are my tips for cleaning your car’s interior. 1. Gather everything you need before you go outside to clean your car’s interior. This cuts out the time you would spend going back into the house to get something you forgot the first time. Garbage bags, paper towels, spray cleaners or wipes for leather, plastic and glass are all things you should have. If you have a hand vacuum, this is the time to use it. 2. Start by removing anything from the car that doesn’t belong in the car. Garbage goes in one bag and things that belong in the house go in another bag. This makes a big difference from the start. When you see progress, you want more. So, now you should be getting excited about having a clean interior! 3. Wash all of the windows and mirrors next. Make sure to wash both the inside and outside of the windows and make them sparkle. 4. Move onto the leather and plastic parts of the car’s interior like cup holders and other compartments. If you have fabric instead of leather you can use an upholstery cleaner to remove any spots or stains. 5. If you have a hand vacuum, you can vacuum the floor mats and carpeting. Don’t forget the trunk. Make sure to move the seats so that you don’t miss a spot. If you don’t have your own vacuum, you can go to the local gas station and use their car vacuums. 6. When you have finished cleaning everything, open all the doors and trunk to let it all “air out”. This can help you get rid of any odors left in the car. You can also put in a car air freshener to give the car’s interior a nice scent. 7. My last tip is to do a web search for recipes to make your own cleaning products. You may find that you prefer the homemade versions over store bought versions of cleaners and they can also save you some money! That wasn’t so bad was it? 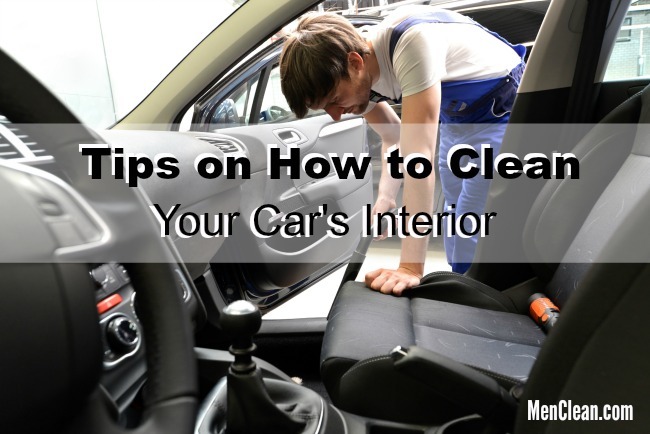 If you know where to start and what steps to take, cleaning your car’s interior really isn’t that bad. Follow these tips at least once a month to maintain the cleanliness and your car won’t ever have a dirty interior again!